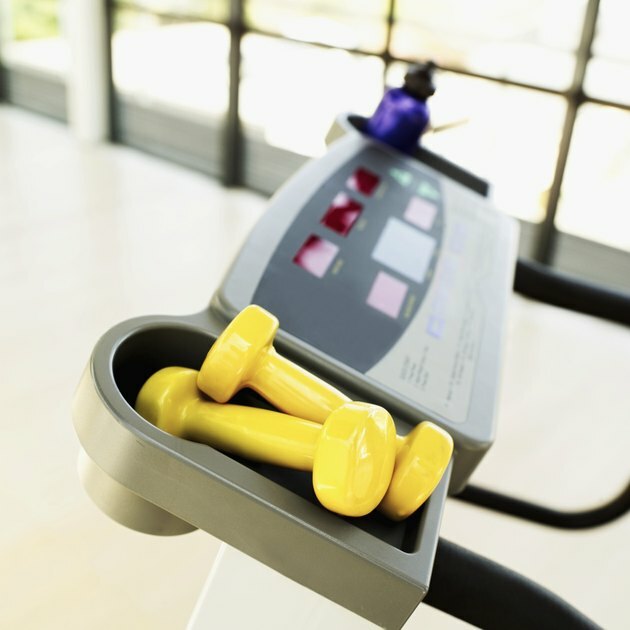 Treadmills are a common method of cardiovascular exercise -- but these machines do not sufficiently work the upper body. One way to solve this problem is to add 5-lb. weight exercises to your treadmill workout. This will promote muscle building and increase the calories you burn. You should keep arm exercises simple and ensure that they coordinate with your walking or running stride. The bicep curl is a simple exercise that works your biceps brachii, brachioradialis, brachialis, trapezius, wrist flexors, anterior deltoid and levator scapulae. The exercise requires two 5-lb. dumbbells and you hold the dumbbells at your sides with your palms facing out. You will slowly bend your arm at the elbow to bring the weights up toward your shoulders and then you will slowly bring them back down. You can choose to do both arms at one time or alternate them, and raise the dumbbells with one step, hold for two steps and lower on one step. The triceps extension works the triceps brachii, pectoralis major, anterior deltoid and wrist flexors. You can use two dumbbells or just one to perform this exercise, but will need two if you want to alternate arms. Start by holding the dumbbell above your head and then slowly lower it behind your head by bending your arm at the elbow. You will then bring the dumbbell back up to the starting position, squeezing your triceps as you do -- raise with one step, hold for two steps and lower with a step. Lateral arm raises work the lateral deltoid, anterior deltoid, trapezius, supraspinatus, serratus anterior, wrist extensors and levator scapulae. To perform this exercise, you will need to slightly bend your elbow and place the weight in front of your pelvis. You will raise your arm out to the sides until your elbow, wrist and shoulder are all about the same height. You will return to the starting position by slowly lowering your arm and positioning the weight in front of the pelvis. Raise the dumbbells for two full steps, hold for two steps and then lower with one step. Shoulder presses work the anterior deltoid, supraspinatus, trapezius, pectoralis major, triceps, biceps, levator scapulae, lateral deltoid and serratus anterior. You will use two dumbbells, with one in each hand positioned to each shoulder. With your palms facing out simply lift the dumbbells over your head while keeping a slight bend in your wrist. Once you have the dumbbells above your head, simply return to the starting position slowly. Raise the dumbbells with each step, hold for a step and lower with a step. You should be mindful of safety and ensure that you can maintain proper balance as you perform the arm exercises. Warm-up your muscles with a 10-minute walk and then do some stretching before you incorporate the weights -- this ensures your muscles are ready for weight training exercises.